Don Alejandro is a 13 generation shaman and Spiritual Leader to all the people in the Maya lands. He has been the leading authority through which Ian Lungold confirmed the dates of the Tzolk’in for us… and through his travels around the world. He is beloved for his mission to share the message of hope. He is called “Tata” by many as an endearment equal to Papa or Grandpapa. Don Alejandro identifies the message as not his own, but passed down through the ancestors, that in this Time and Place there would be a return of the men and women of wisdom – the return of the Ancestors through us. Tata Believes on our behalf through the Love and Guidance of 13 generations. Joseph Giove is a long-time friend and caretaker who helps to see to Tata’s needs. Tata is currently 92 and bedridden. He’s unable to travel to the doctor, so Joseph has asked for donations to help cover the care of having a doctor visit him at home. I have been wondering at the progress as I’m sure many of you have too. Yesterday, Joseph advised me that Tata has recorded a video message to share with everyone. As soon as he returns from recent travel, Joseph will post to share with us. Joseph said that Tata is grateful to know the Love of those sending their prayers of support. May we be grateful for all the prayers, rituals, and sacred ceremonies that Tata has carried out for you and me and the whole. May we give thanks for all those who have the Faith and Dedication to Believe on our behalf. May Tata be held in the comfort of our Love. Tone 3 holds the Intention of Movement. Through a physical movement or communication toward an Intention of Creation, we bring Life to a New Vibration. Intention is the Force of Movement by Spirit. We engage the Force of Spirit through a Dream of Creation we project onto our future. Our first step of Intention is the Beginning of a Creation we dreamed to its End. The frequency of the Vibration will be established by a Meaning and Purpose. Creation is always inspired by a Reason. When we Create for a Reason of Love, we bring Life to a vibration that is Resonant with the Creator’s Pure Vibration of Love. We weave a vibration into the fabric of a Divine Design that will naturally draw our vibration into Harmony. Wind/IK is the Breath of Life and Breath of Spirit. The Element of Air connects us all. Sound is carried through the Wind. The glyph illustrates the “T” portals carved in stone that magnified the sound of the wind and were used to chart the stars. The “T” represents the Tree of Life and “Te” the Sacred Word and Sound of Creation. The Sound of The Creation still lingers in the air as the First Vibration of the Creator’s Voice. Through the Wind we Breathe and are Breathed to Life by the Creator. The Cherokee Whirlwind is the 13th Dancer Above who leads the 12 below. Whirlwind is the double-helix of smoke that carries our prayers to the Creator. Wind is the Whirling of Life and the Breath of the Universe. Breath is the most critical Element of Life drawn through the body by the Heart. Wind resides in the North, the direction of Wisdom and Innocence. The Element of Air relates to the faculties of the mind. When we bend to the Wind, the Element of Air holds the Power to engage our thoughts. Wind/IK is the sign of an inquiring mind. 9 is a Spiritual Tool that Multiplies our Spiritual Resources of Wisdom and Genius. Think about it. Some of our ideas never make it past the dream. The ones that do are the ones we’re naturally inclined to explore. We can use this Number 9 as a tool for Discernment. Wind/IK is the Breath of Life and the Breath of Spirit. Wind/IK is the whirling of Life itself. The Element of Air is our most fundamental resource of Life, and the Element our Bodies are most critically dependent upon. Air is the Element that connects us all within the One Rising and Falling Breath of the Cosmos. ALL Life is supported by the Divine Breath of the Creator. The words that were spoken at The Creation are the “prevailing winds” of our Life. 9 Wind/IK, Kin 22 is a portal day that represents a thinning of the veil to the dimension of Spirit. The Element of Ether is a substance of “pure spirit.” A portal magnifies our Spiritual Gifts of Intuition and Knowing. This is a day of Heightened Consciousness. A Portal on 9 Wind/IK magnifies the Breath that directs our Transformation. 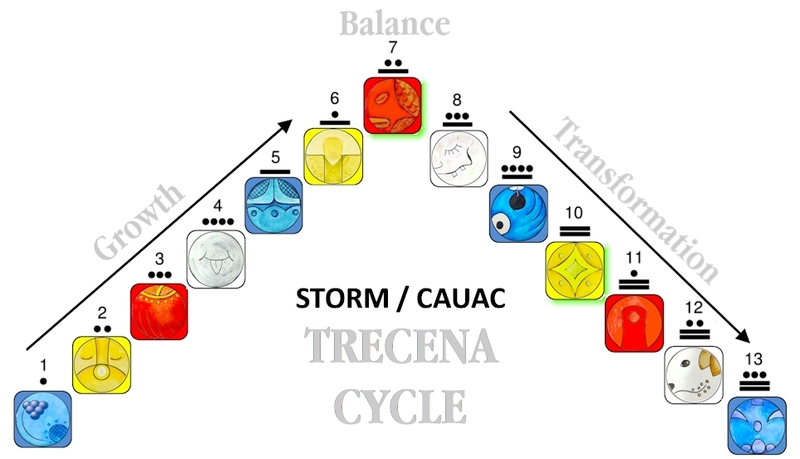 The Peak Tone 8 initiates the Transformation phase of the trecena. Our climb to the top of the pyramid was a Human effort of Faith. Energy shifts from a climb to our descent as an Unseen Force begins to draw us forward. Tone 8 holds the Intention of Divine Justice with the Creator’s return in the Promise of a Sacred Exchange. The Effort of Consciousness we invested in holding the Vision of our Dream, is Balanced by the Equal Effort of a Divine Agency. Each Transformation builds on the Higher Ground of the Last. We Ascended from the Wind/IK trecena and now IK returns on the 8th Tone of Transformation as the Wind beneath the Eagle’s Wings. The Element of Air relates to the mind, positioned in the North, the direction of the Divine Mind and the Collective Wisdom of the Ascended Masters, and the Wisdom of our own Experience. 8 Wind/IK is the Breath of Transformation that can Purify our Thoughts. MAYAN HOLY DAY OF PURIFICATION: Tone 8 is the day of the trecena marked for the observation of Holy Days and Sacred Ceremonies. The 13 Tones reflect the 13 Hours of Solar Light known by the Maya to begin at 5AM to 5PM. The 8th Hour is Noon, when the Sun resides in its zenith, its position of Highest Illumination. Tone 8 is the number of “pure spirit.” 8 Wind/IK is observed by the K’iche Maya as the Holy Day of Purification. The Voice that Spoke the world into Creation, offers a Purification of our Mind through the Illumination that we were created just the same. All the “rules of the game” that apply to the Creation of Mother Earth, apply to Human just the same. The physical laws we learn through Mother Earth demonstrate a Divine Justice that upholds the Authority of the Creation. A Divine set of rules insures the balance of Divine Justice for everything. The Promise of Justice is the Divine Covenant of Harmony and Equity and the Creator’s Rule of Unconditional Loving the Whole of Humanity. Our thoughts and minds can be made pure, through our Consciousness of the Authority that is held in the Breath of the Creator.